Put your trust in a service in Hornchurch with a client happiness rating of over 96%! A: Your panes will be washed by a team of certified and background-checked window cleaning specialists. Q: What services does window cleaning Hornchurch offer? 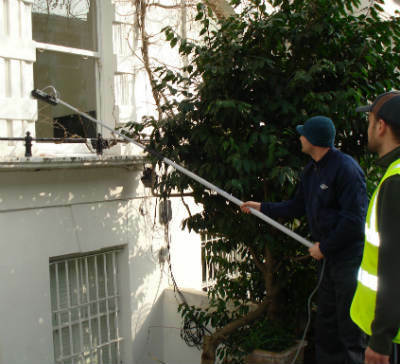 A: The cleaners will perform exterior window cleaning with the help of the latest water-fed pole equipment on the market. For premises above the fourth floor, we'll send in seasoned abseilers for rope access window cleaning. For inside pane polish, the team will employ standard ladders and squeegees. A: A few of raindrops won't undermine the Hornchurch window cleaners' work – rainwater is usually deposit-free. However, if we face a cloudburst, then we will kindly ask you to suspend your session for another day. A: As long as the cleaners can enter your front gate, they can blast away all grime without you having to be around. If your panes need a thorough inside polish as well, then we'll arrange a swift key pick-up and delivery service. A: Usually, the distilled water tank inside the team's washing vehicle is always full. In case the tank is empty and with your approval, the technicians can painlessly connect the water-fed pole to any accessible water source. A: Once we notify you that the team's on their way, you'll need to ensure that they can enter your property unimpeded. In addition, the specialists will need a parking slot within 30 metres from your property and on the same side of the casements you want treated. With the intuitive water-fed rod gear, the experts can help you outclass your competition at fair rates. And you can slash our window cleaning Hornchurch rates even further by merging two or more of our washing services together! To find out the exact numbers behind our price offers, make sure to browse our handy price table below. With window cleaning in Hornchurch, we can improve the appeal of your building even if it scrapes the clouds above. Let's review what you'll get once you book our custom-tailored service. For exterior window washing, the Hornchurch window cleaners will utilise a telescopic water-fed pole. A water pump inside the specialists' van will send purified water up the hose and out of a brush-head attachment. The water, together with the brush-head, will undo any traces of dust from the windows of any four-storey building. With rope access window washing, the pros will use sturdy climbing gear to reach even the topmost storeys in your commersial or home property. We possess all required COSHH documentation and risk appraisal reports and can send them to you as soon as you need them. In addition, we frequently check the cleaning gear to ensure that your appointment will go without any complications. And to dight every interior corner of your window façade, the proven team will use the established sponge and ladder cleaning method. In our goal to help as many Londoners as we can, we've broadened our window cleaning in Hornchurch to cover extra locations across the metropolis. For your comfort, we've mentioned the names of these nearby locations below. For those of you who'd rather book window cleaning services Hornchurch RM13 online, fill in our get a free instant quote form.